I read this article and found it very interesting, thought it might be something for you. 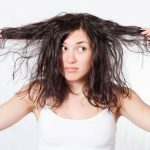 The article is called Mask To Fix Dull Hair and is located at https://homemademasks.net/homemade-hair-masks/homemade-hair-mask-for-dull-hair/. If you too wonder about the possibility of having shiny silky hair like you always see in various styling products commercials, I am happy to say you can achieve it. All you need is just a few good tips and a bit of patience. You might know by now how wonderful oranges and lemons can be for your health and how many benefits you can gain by including these fruits in your eating habits. With a single orange you can provide your body the necessary needs for vitamin C for a whole day. Oranges are fruits that can help you grow healthy dense hair while bringing shine to it as well. First squeeze the juice from both the orange and the lemon leaving the pulp out (I tend to use a sieve to make it easier). The next step is to add the honey along with the olive oil, mixing them together. Apply the mask on your hair, massaging your scalp for ½ a minute. Leave it on your hair for 1 hour. After that wash your hair like you normally do.